Home > Climbing Plants & FREE P&P > Evergreen Climbers > NEW INTRODUCTION Lonicera japonica 'Darts World' EVERGREEN SCENTED FLOWERS. HARDY. ONE OF THE BEST ALL- ROUND CLIMBING PLANTS INTRODUCED! 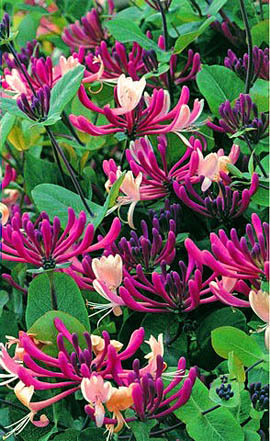 NEW INTRODUCTION Lonicera japonica 'Darts World' EVERGREEN SCENTED FLOWERS. HARDY. ONE OF THE BEST ALL- ROUND CLIMBING PLANTS INTRODUCED! Description: A NEW introduction, this particularly hardy evergreen climber with bushy spreading habit, has dark green leaves and very fragrant red flushed flowers that turn yellow. The flowers are carried in pairs from spring through to late summer. Fully hardy. Grows in any well-drained soil or compost if growing in a patio container and train according to the space available. Plant in sun or partial shade and has very fragrant flowers over a long period.